Gone are the days when (some) pet dogs got wet in the rain and dressing up was something thechildren did-from hoodies to crystal charms-doggie divas can have it all. Some dogs need the protection of a warm waterproof layer. They may be elderly or young and feel the cold, recovering from illness and unable to maintain body temperature efficiently, they may also have just been clipped when the weather changed, or their owners simply don’t want them to smell like wet dogs...There are practical reasons for wrapping up warm. Rightly or wrongly (it’s a matter of personal taste) the dog boutique business is big. It has gonebeyond the practical reasons for dressing up dogs and entered into Trinny and Suzanna territory. There are dog boutiques on the high street, mail order firms and exhibitions of dog clothing aroundthe world. Owners spend fortunes on dressing their dogs. Anything goes-from a simple rakish bandana to the full, super-hero outfit. Some places even hold ‘engagement and wedding ceremonies’ for dogs, complete with brides dress and accessories, bridesmaids’ outfits, morning suits for the groom and best man; photographer and wedding cake. Halloween and other fancy dress outfits are also de rigueur for the real party animal. Of course, these precious pooches need somewhere to store their extensive designer collections! Bedroom furniture-yes, the whole suite-can be bought to match the deluxe boudoir. Four-poster beds, wardrobes, sofas and drawers are available for the fashion-conscious canine. What Do the Dogs Think? Has anyone asked them? Some dogs love all the attention and fussing they can get, whatever form it takes. As long as the outfits don’t impede movement or normal doggy functions it is up tothe owner. It is important to measure dogs properly, because wearing the wrong size collar, for example, could cause breathing difficulties and rubbing of the sensitive neck skin. The best clothes in the world can’t hide a dirty coat! Often run within the dog boutiques is a grooming business, where dogs can have a basic bath and de-ticking, or the full works, including massage, perfume and bows. Independent grooming businesses can provide a popular and efficient service without additional boutique facilities. All dog owners should keep their dogs coats clean and well-groomed-not for the sake of fashion, but for the dog’s comfort, health and hygiene. It is also an important bonding process and a way of checking the dog for injuries and parasites. Some breeds do not shed their coats and need regular clipping to keep the coat manageable and comfortable. Long-haired dogs may need theattention of a professional dog-groomer, if their owner finds it difficult to deal with the washing, drying, and brushing of the dog’s coat. It may be that owners simply prefer to have someone elsedo the work-it can be messy! 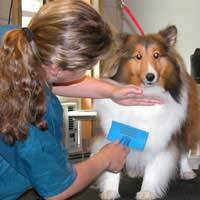 Grooming businesses offer a range of services-including nail-clipping, eye and ear cleaning, as well as washing, drying, trimming and haircuts. They have the expertise and equipment to do tasks that may be impractical for owners to undertake at home. It is also good for the dog to be handled by others. There are no qualifications necessary to start a dog boutique business, but practical and creative skills, along with good business acumen are needed. A sense of humour is helpful. Dog grooming services have been around for years. Practical experience is a must in order to be successful in this, while qualifications are desirable. A genuine interest in dogs, their well-being andappearance, helps.